The Automat. 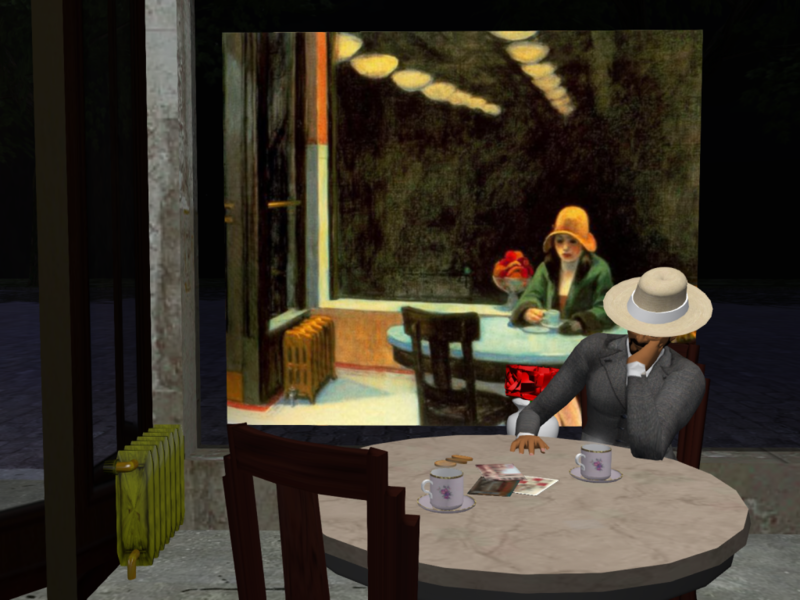 A Painting by Edward Hopper, and now a Virtual Installation for the public in Second Life™ by RJ Kikuchiyo, an award-winning VR designer. Here, RJ demos the beverages and food vending machines for an upcoming event. The technology of the time allowed visitors to get a meal without interaction with the food preparation, very much predicting the science of food vending in the modern age. A coffee was a nickel. A sandwich, two nickels. In the age of Hopper, this was a refuge from the urban outdoors, a place of comfort, even if only for a short time. Interestingly, this was a time when modern design was coming into view, forward-looking and fantastic. Perhaps this painting by Edward Hopper was a reaction to that cold steel and glass society. I embrace the humanity represented in the view, a single female patron, her emotion and her poise in the face of the new technology within which she finds herself surrounded.